Please contact us for booking requests! KAMIKAZE KINGS: Best Rock ‘n‘ Roll Extravaganza ever!!! For months the underground has been rumbling about a very special thing that grows in the windy alleys of Berlin. 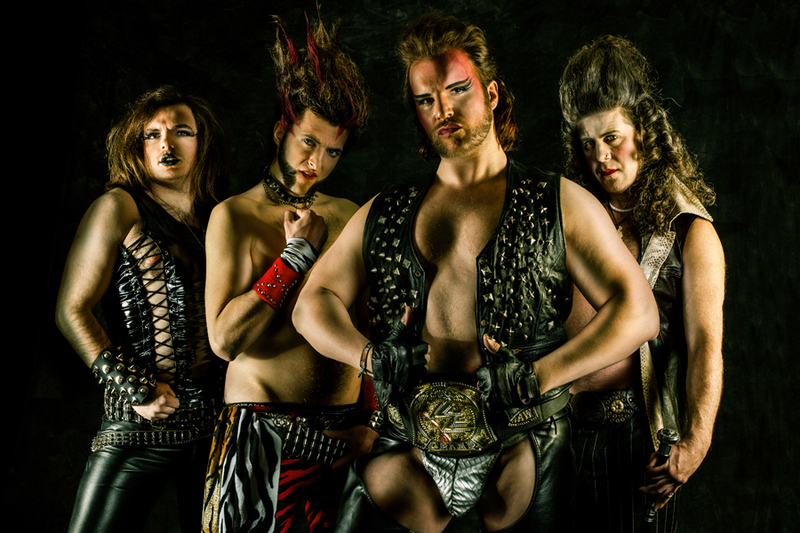 For some, KAMIKAZE KINGS are the German answer to Steel Panther, others think of them as a mangy mix of Peter Pan Speedrock and Mötley Crüe! Led by vocalist Elmo Kamikaze, a cross-breed of “The Rock“ and “Rob Halford“, KAMIKAZE KINGS are one of the fewer bands, which you just have to notice shortly and will never forget! Finally the time has come on August, 31st! The long expected debut album “The Law“ will be released through Limited Access Records! “The Law“ was produced by the heavy rock specialist Dirk Faehling (Motörhead, Skew Siskin, Jingo De Lunch) at Audio Ego Studio in Berlin and includes 14 tracks, which play out the whole spectrum of heavy Rock ’n’ Roll. The smashing opener “Burn Baby Burn“ leads to the fighter hymn “Boys ‘n‘ Men“ and the party hit “Just Dance“ and back to the doomy “Bible Black“- there is a right song for everybody. Especially the title track “I Am The Law“ points out the attitude of KAMIKAZE KINGS: Live and fight for the music! One for all and all for one! Rock ‘n‘ Roll and Heavy Metal are not only a passion for vocalist Elmo, guitar player Randy, bassist Kev and drummer Rais, but rather a religion and a home at once. KAMIKAZE KINGS have gone through some stormy years since their founding in 2009, which other bands wouldn’t have survived intact. From that point of view, “The Law“ went through a long process. The band sometimes hungered to pay the recordings. Nevertheless or especially due to those reasons, the album spreads a power, directness and immediacy, which is unmistakable. But it is not only the musical finesse which gives KAMIKAZE KINGS the highest factor of adrenaline-pumped entertainment. As pure manifestation of leather, sweat and rivets with a rich portion of Glamour-Wrestling mania, they lay every club and festival in ashes. On the big screen, these four Berlin guys know how to act controversially and nonconformally. In their clip “Saturday Night Hero“ they present themselves as real giants of pure Rock ‘n‘ Roll and especially in their new music video “Boys ‘n‘ Men“ they show their distinct trademarks. The first single “Boys ‘n‘ Men“ is not only rocking, but it is also a great entertainment for people, who are not of a tender or weak nature! Those, who have seen a live show of the band before, know that KAMIKAZE KINGS work more than hard. The songs, the performance and devotion with which the musicians go about at their stage performances, transports a sense of life, an attitude and a love towards the most beautiful matter of the world: Rock ’n’ Roll. In this sense: Yes, they are „The Law“!! !